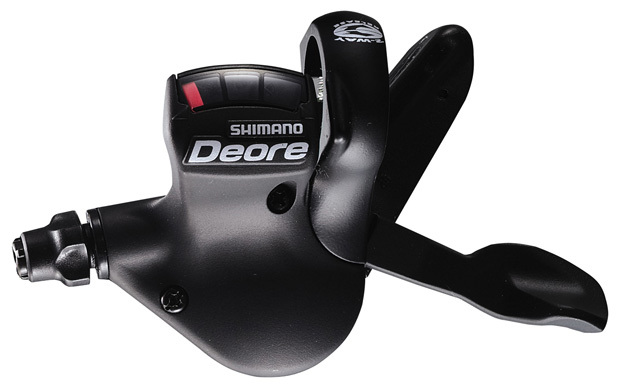 Derailleur Gears: A practical guide to their use and operation. "Superb, pick up, drop off. Thanks mate, rides like a new bike at a fraction of the cost. Highly reccomended." Try not to be daunted by your gears. A little understanding can go a long way. 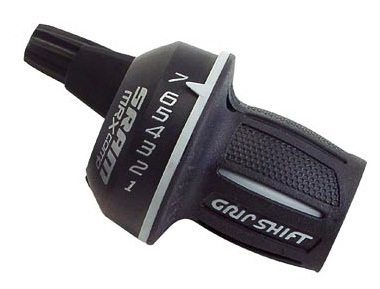 Shifter – The device you use to change gear, that is to make the chain move between cogs. This may be a lever, twist grip or other. Most bikes will have two shifters. Sprocket – One of the cogs making up the above. Chain – Well, I'm sure you know what this is. 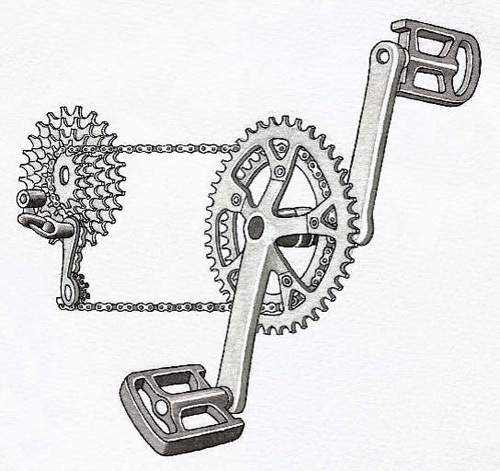 Cranks – These are the two arms into which the pedals fit. The RHS (Right Hand Side) crank is attached to your chainset. 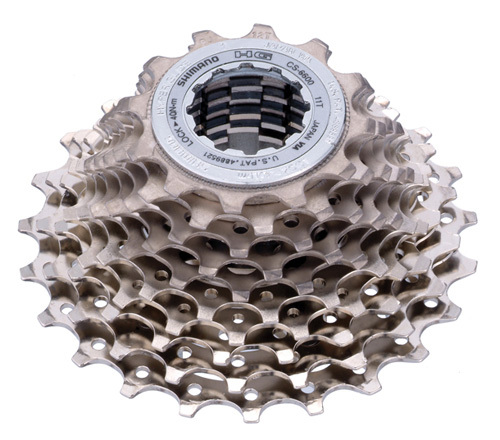 Transmission – This is a collective term for your chain and the cogs on which it runs (the Chainset and Cassette). The transmission ‘transmits’ your pedalling action into movement of the rear wheel and then off you go. Low/High - A common problem when discussing people’s gears and their operation is varying terminology for which gear they are in. “It doesn’t work in 3 and 4,” for example can be quite ambiguous. It is more useful to talk about low and high gears. Low gears make pedalling easier and are used for setting off and going up hills. High gears are used when you have built up speed and are travelling faster. On your rear, wheel the low gears are the bigger cogs and the high gears are the smaller cogs. 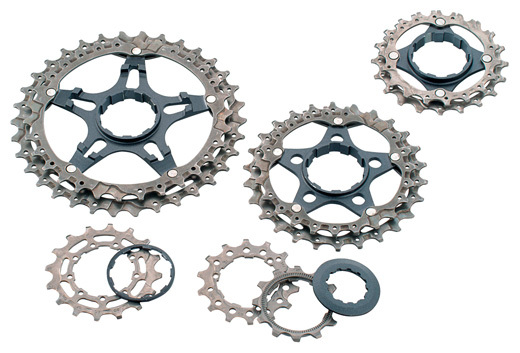 Conversely at the chainset, the smaller cog (often known as the granny ring – can you guess why?) is your low gear, whilst the big cog is your high gear. Complicated, isn’t it? Your point of contact with your gear systems is a ‘shifter’ of some type. In the olden days, to change gear with a derailleur, you had to judge how far to pull a lever to make the chain move between the cogs, known as ‘friction shift.’ These days most shifters are ‘indexed,’ so you ‘click’ to change gear. Indexed shifting is a superb invention, but it does not make changing gear foolproof, far from it. Firstly - and this really is one of the most important pieces of advice that I can offer - if your shifters have a visual display of what gear you are in, a number or the like, try not to look at it! Riding a bicycle with derailleur gears means that you are operating a mechanical linear machine. It is not like using a TV remote control, cash point, computer or the like. When you move your shifter, you are pulling an inner cable that is sliding under resistance through an outer cable and forcing a derailleur to change shape, thus pushing a chain sideways and hoping that it will move on to another sprocket. You are in charge of this action. It is a complicated system and requires skill, timing, anticipation and concentration. Ok, as outlined above, you probably have two sets of gears on your derailleur-equipped bicycle. 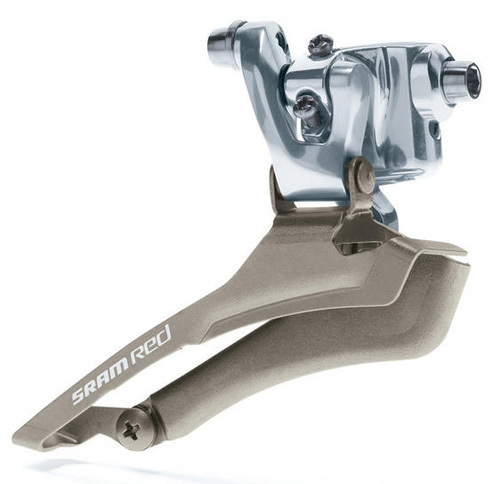 The right hand shifter is on the right of your handlebars (as you look forward whilst on the bike) and controls the rear derailleur, which moves the chain between the sprockets on your rear wheel. This is the shifter you will use the most and can very roughly be approximated to the gears on a car. The lower gears (in use when the chain is on the bigger sprockets) are easier to pedal in and are used for setting off from stationary and riding up hills. Then work through the gears (from the low to the high) as you build up speed and travel along the flat or go down hills. Changing gears with the RHS shifter should be very clean and over time become second nature - just a click and then a smooth transfer of the chain from one cog to the next. Constantly assessing what lies ahead and how to respond to it, you find yourself changing gear automatically to deal with any eventuality. This may sound a bit wistful/idealistic, but it really can be like this. 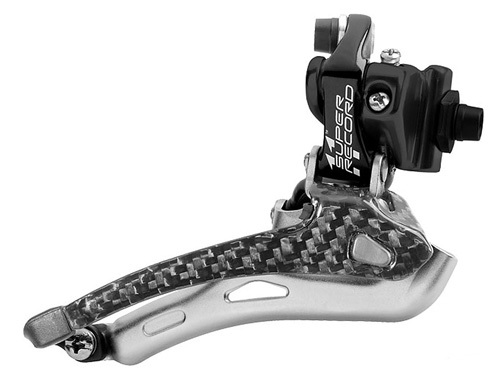 The Front Derailleur / LHS Shifter. This is the big one and if the truth be told the reason behind my writing this article. If you have two or more chainrings (the most common is three) then you will have a LHS shifter that moves the chain between these chainrings using your front derailleur. 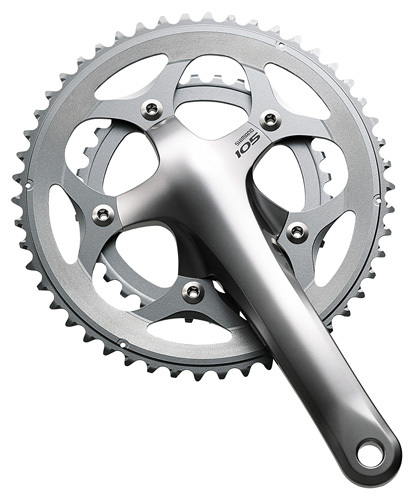 Smaller chainrings are easier to pedal in, but less power is transferred to the rear wheel. Conversely the largest chainring provides more power to the rear wheel, but is harder to pedal in. Which to use and when depends on many different factors. If you only ride on the road and don’t tackle any extreme hills you may never need to use the smallest chainring. I would suggest using the middle chainring for setting off, casual riding and most hills; the largest one for riding fast, pushing the bike hard on the flat and down hill. Issues with shifting the chain between the chainrings using the LHS shifter are probably the most common problem we see. All is not lost, though; it is not some kind of weird and wonderful black art. However, it is the most difficult part of operating the gears on a derailleur system. The jump in the number of teeth between the different sized chainrings is far greater than between the sprockets on the rear wheel. The front derailleur is a very different device to the rear and the advice to ignore the numbers on the shifter holds even truer for this. 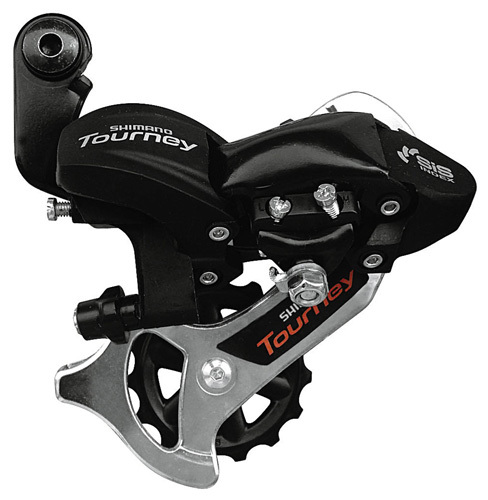 Whereas the rear derailleur holds and guides the chain very specifically, the front derailleur essentially just uses two plates either side of the chain to push it sideways. The rest of the work is done by the rotation of the chain and chainset (through your nice smooth pedalling action) and the ‘hook’ effect of the cogs on the chainring that is being changed. The idea is that the hook picks up the chain and engages it on the new cog. 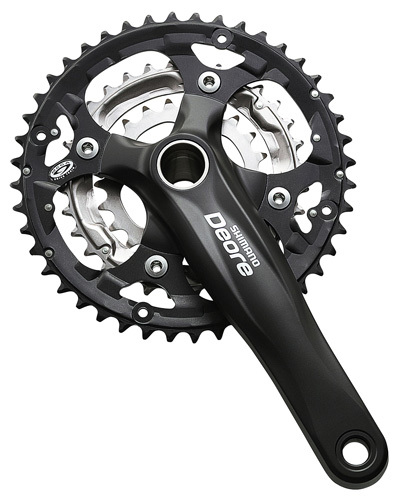 Generally changing down (from bigger to smaller chainrings, so the chain is moving from right to left) is easier as once the shift is made, the derailleur pushes the chain sideways and it drops down through the space onto the smaller chainring, where the teeth will pick it up. 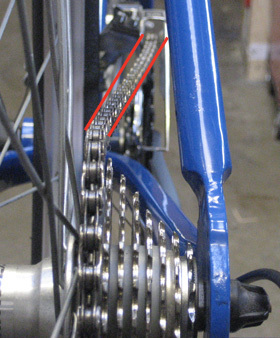 Harder is the shift upwards to a higher gear (from smaller to bigger chainrings, so the chain is moving from left to right). When you operate your LHS shifter to move into a higher gear, often two extra things are needed over and above a normal shift. These are the ‘extra push’ and the ‘pregnant pause’. ‘Pregnant Pause’ – When changing to a higher gear (bigger chainring) using the left hand shifter, don’t just ‘click’ and then let go. Use the ‘Extra Push’ and then wait for a short moment – this ‘Pregnant Pause’ this will give the chain a moment to engage with the teeth on the larger chainring and then settle onto it. Once you have felt/seen this happen, and then let go of the shifter. With the chain happily moved onto the bigger chainring, the front derailleur will now settle in its normal position. This may all sound very complicated but once mastered you’ll hardly feel that you’re doing these two things. They really can be very subtle but have a big impact on your gear changing experience. If your bike is correctly set up, then when you are in the middle chainring (if you have three) and the middle sprocket of the rear wheel, the chain will run in a perfect straight line, parallel with the wheels and direction of the bike. As you use different combinations of gears, the chain will flex from side to side to accommodate the difference between the lateral positions of the front and rear cogs on which it is travelling. This angled line that the chain follows is known as the chain line. Many riders are unaware that certain combinations of gears should not be used. 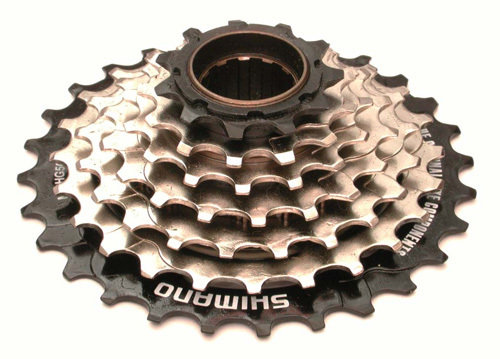 In the most extreme combinations of gears - either running the chain on the largest chainring and the largest sprockets on the rear wheel, or the smallest chainring and smallest sprockets - the chain line will become very severe. This results in extremely poor operation, rapidly increased component wear and potentially the chain coming off and jamming, even on an otherwise correctly set-up and maintained bike. By not attempting to select these gear combinations, you will enjoy improved performance, greater reliability and increased component and, in particular, transmission life. 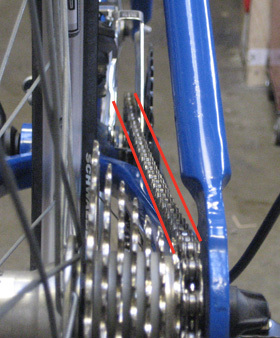 The following three images illustrate normal variations in chainline, demonstrated on a bike with a single front chainring. Click on the images for larger versions and further detail. The next three images show the effect on the chainline of selecting the most extreme combination of gears. As before, you can click on the images for larger versions and further detail. Pedalling – Change gear when you’re not straining the chain with effort, but when your legs are just smoothly rotating. 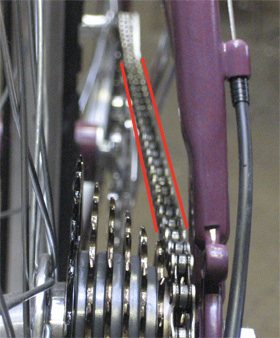 Modern cogs have little ramps and ridges built into them to aid the smooth transfer of the chain from one to the next. 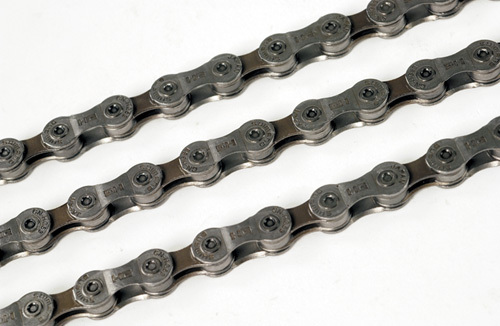 A naturally flowing chain will follow these, giving that satisfyingly smooth shifting feeling. Change through the gears one or two at a time - It isn’t a simple as just ‘clicking’ your shifter. Making the chain ride up and engage with another cog is a combination of your smooth pedalling action and a crisp clean shift. Sometimes you need to press your lever or twist your wrist just that little bit more before you release it. Aim for a good firm shift rather than a cautious hesitant one. 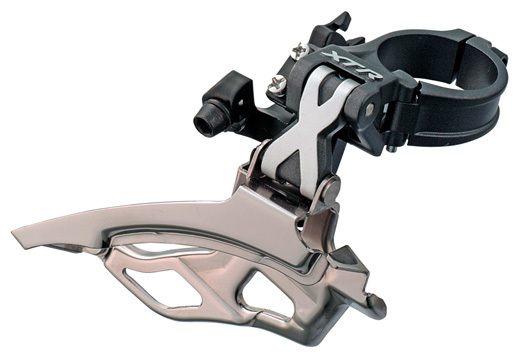 Every shifter/derailleur combination is different; develop a feel for yours. Anticipation is key – With derailleur gears, you cannot change gear when you are stationery and changing out of the wrong gear whilst you are going slowly or pedalling up a hill for example can be very difficult. You need to be in the right gear for the moment. Always remember to change down to a low gear before coming to a stop or hitting a hill. This will keep you ahead of the game and help you to avoid the dreaded ‘crunch’. For example, try to link seeing a red light up ahead with changing down. You'll soon find yourself doing it automatically. Crunch – You know that nasty noise that comes from your gears when you try to change gear when the chain is under excess strain? It hurts your bike. If I said excruciatingly, I’m sure you’d think I was exaggerating, but when you hear it, it means your bike is in pain. I’m not talking about odd clicks and ticks that are a normal part of riding nearly all bikes; I’m talking about the crunch. I reckon I crunch my gears about once a month. (Maybe on a bad month three times.) If you can eradicate the ‘crunch’ from your time in the saddle, then your relationship with your gears will become a beautiful thing. Avoid trying to change gear when you are ‘out of the saddle’ (i.e. not sitting on your saddle) when your weight is being borne by the pedals. 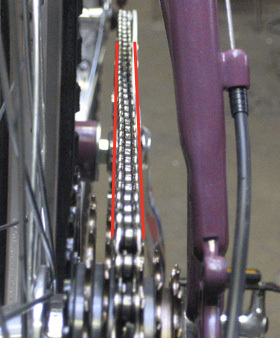 The pedals are being held back by the resistance of the gear system and rear wheel, as transferred by the chain. 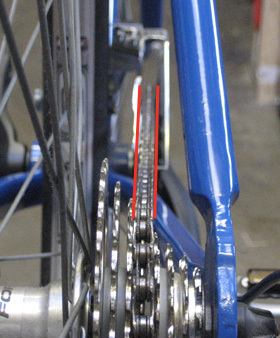 Your chain is under full stain and not in a position to smoothly change gear. Use a good selection of your gears and spread the wear. Try to avoid the temptation just to cane it around in top gear. If you spend most of your time in just one gear it will soon wear out. By varying the gears you use, your transmission will last much longer. Backpedalling – When in gear, backpedalling is usually fine, but whilst changing or if your gears are not properly in tune, it can quickly throw the chain off - with potentially serious consequences. I’d keep it to a minimum. Now this may all sound like just too much effort. But really it is not, what is needed is quite simple: PRACTICE. 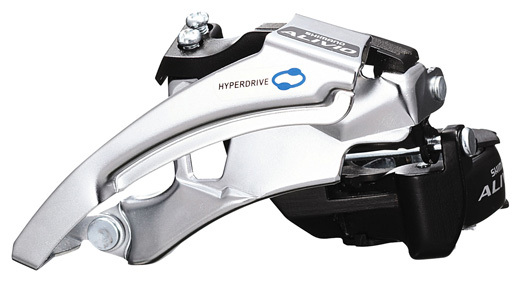 Just like operating virtually any other mechanical device, riding a bicycle equipped with derailleur gears is a skill. The more you do it and the more concentration and focus you put into learning to do it, the better you will get and the more natural it will become. In addition, every bicycle has its own particular foibles. You need to get to know your bicycle and how it works and responds to you. We regularly see customers who have gone out and bought a new bike (often a cheap and poorly set-up one) and with little or no experience as how to operate it, set off to use it. They quickly become frustrated and dissatisfied with their riding experience. But little wonder – should someone drive off in a car with no real knowledge of how to operate it? Or perhaps attempt to operate a machine in a factory with no training? It’s true that many people do have experience of riding a bike from their childhood, but this is rarely enough to be able to successfully set off into the traffic on a modern adult bike. What is needed is practice. Pick a quiet day and go to an empty car park or similar flat, paved, open space. Ride around and practise changing gear. Work your way through them, stop and start, develop a feel for how your bike and its gears operate. Start to build that relationship – where you are in control. Once you feel comfortable on the flat, progress to some more challenging roads. Even better, go for some lessons. There is an excellent charity based here in Hove called Bike for Life that does adult cycling lessons both one-on-one and in groups. These can be invaluable in helping you develop a good relationship with your bike and your road use as a whole. Fair enough, not everyone needs the latest 27 Speed high specification machine. But gears are there for everyone. Although they can be quite daunting at first, with focus and practice, this will soon pass. By using them you’ll find that your cycling experience will be much improved and your bike will thank you for it. Smooth, regular use of your gears will result in a better-working, longer-lasting and more reliable ride. The relationship between you and your bike should be of master and servant. You are in control; it does what you tell it. Learn how it works, treat it well and it will give you much benefit and pleasure. I've spent the last couple of days searching for simple information on how the gears work and how best to use them. Yours is by far the best article I've come across - thank you from a 60-year old getting back on my bike for the first time in decades! 50 years since I last rode a cycle, this was a great reminder for my new cycle.....thanks. The "chain line" was very well described and depicted - the hints and tips useful. Thank you for a clean and easy to understand article. OMG you are a saviour been googling all day, after being out on my new bike a few times and realising I didn't have a clue. This has been tremendous. I can't thank you enough. With your friendly, encouraging and patient explanation of even the very basic of the parts of the bike, specifically gears, I am able to enjoy riding my new bike with confidence and even pride. You see I have been cycling over the past 10 years using a second hand bike but never knew much about anything except to paddle ! Asking bike retailer or watching You Tube videos only made me more confused because they expect or assume prior knowledge which I did not have. Now at 67, I finally find the help that I so desperately need. Now I enjoy cycling with renewed energy. I can't thank you enough. You are simply amazing people, I so treasure the precious knowledge you impart on me. Thanks a trillion. Excellent article with link to photos for a beginner! Thanks for sharing expertise in a simple language. Great little article! Thought my recently serviced Marin was not running properly, as changing the front chainwheel from 1 to 2 wasn’t smooth. Your “extra push “ and “pregnant pause “ explanation will hopefully solve this! I am like many posters here , last on a bike )5 speed racer!) nearly 30 yrs ago! So changing to 21 gears was a shock! Many thanks. brilliant clear article thank you muchly. I got my first modern bike in my 50s, after moving to a city where it looked useful to have. I've been riding it now for almost five years without a real understanding of how to use my gears. This article was extremely helpful! Good article! Made me feel a little less intimidated with my derailleur 21 gear system that I have yet to adjust. Currently have to keep my thumb on the shifter to stay in the top chainring. As a lapsed cyclist of 45 years and never having ridden a bike with gears this is all very helpful. Thanks for a very valid and interesting article. Being brought up on 3 speed Sturmey Archers, derailiers have always been a mystery that is best avoided. That is, until now. I am off to crack my 24 gear Dawes, and with practice I will master the black art. My thanks for your time and effort, it is much appreciated. I am 70 by the way, it's never to late. I just bought a new bike, and took it back because I thought my gears weren't set up correctly. I was then explained about using the two biggest or smallest cogs, as you explain so well here. It's a very important tip, as is your well written article here. Awesome article. The way the extra push was explained, I remembered the same mistake I did when I was learning to change gears. And I didn't know that I shouldn't ride with any combination of my wish!!! Thank you for sharing this article. Best article I've read thus far regarding anything of a bicycle!! New to mountain biking & this has really made me want to just ride locally and around the block a few times to just get even more acclimated with switching gears! Excellent article keep it up!! Great article....new to riding (but determined to increase my fitness levels and enjoy some fresh air) this has helped my understanding of the gearing on my new Hybrid bike (3 front, 7 rear gears). Can't wait to try it out again tomorrow on a short local ride. I already know all this stuff, but I thought your explanation was very comprehensive and very clear. I enjoyed it. If you can include a few pretty pictures to show cross-chaining as well as the different gear ratios and leverages in Low 1st and High 8th, your article will be even better. I've owned my bike for 18 years. As a kid, I rode 1 and 3-speed bikes, so its 24 gears did me in when I first got it. I didn't ride it at all for 17 years! With an 8-year old son addicted to his bike and begging for longer rides, it was time for Mom to figure it out. I got the bike new tires & tubes (installed them myself, another learning experience), and a complete tune up. Today, I rode 3 miles and spent a fair bit of time figuring out gears; I only walked one steep hill and I'm proud of my effort (and sore). This post has helped me think about my gears in a different way and I'll go practice on the flat tomorrow to increase my confidence, skill, and therefore, safety. Thanks for taking the time to write it. I am just beginning to use my bike again after 14 years in the shed. It's just for around the town so I am off to put the LHS to the middle cog!!!! Thank you for an explanation that was understandable even to someone with no mechanical knowledge. Thank you for writing this! I just got my first multi-geared bike and this has BY FAR been the most helpful. Fantastic article! Just one point: what you refer to as cogs are actually sprockets. For them to be cogs they would have to be in direct contact with one another. Well written and explained as far as it goes but I'm no nearer being able to choose a front/rear/chain combination. Excellent article. I bought a nice mountain bike at the weekend, took it out for a spin but struggled with the shift to the big ring. Now I know why and can't wait to get out again to put this advice into practice. Also, I can use this to help my daughter learn how to use her gears properly. 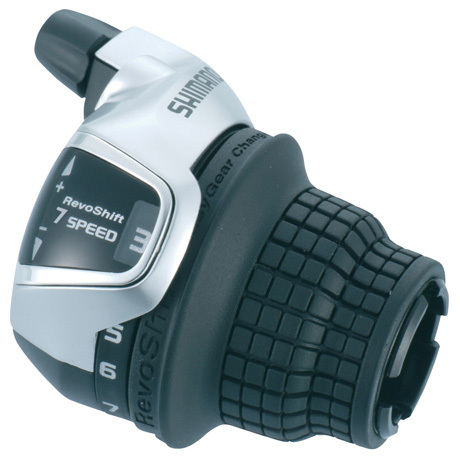 Last bike I rode had a 4-speed Sturmey Archer Gear system. Thanks for a great article ...sound easy now?!! At last I understand.thank you. I Have Just Bought A Bike At Age 67 And Was At A Loss On How The Gears Work! After Reading This I Think I Will Have A Better Understanding Of Modern Cycling! I Suppose Time Would Have Let Me Work It Out. Now To Go And Put Theory Into Practice. Well Done This Article! P.S. YES! Result! Many thanks again. Like Paul Buckroyd(10 May 2015), I'm 67 but a novice cyclist. Bought my first bike (21 speed) 3 months ago. Read this article and found it very useful. Have just about mastered gear-shifting but a couple of niggles remain: I've just re-read the article and can see the solutions ("extra push" and the "pregnant pause"). Can't wait to try them tomorrow. A great piece of concise instruction. Many thanks. I'm an old-timer - one of those used to 3 gears. Then I moved on but unfortunately my thinking didn't. 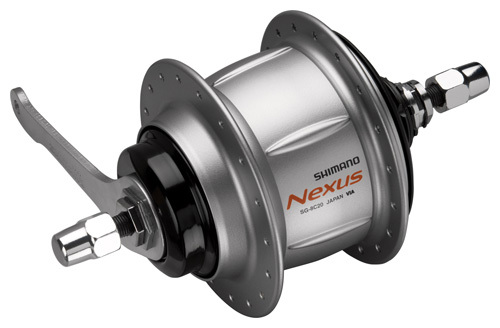 So this article has helped give me the confidence to start using my Shimano gears correctly. I had been avoiding changing on to the biggest chainring since the chain had slipped off whilst I was out and entailed getting greased up to replace it. But now I see the reasoning and can use your tips to change gear safely - I just spent a fruitful half-hour practising and found I can do it! Thanks from an old dog who has learned a new trick. 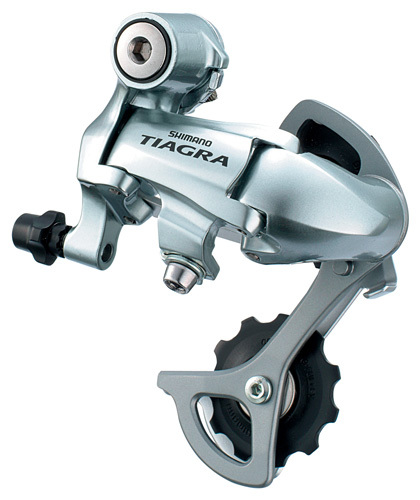 do you ever fine tune shifter/resistance by either using the small HI/LO screws on front and/or back derailleurs. This will get you into a"you are one with the bike" attitude! TRY IT! Thank heavens someone had the sense to explain, and simply, how to use these gears. Great stuff! I was fascinated with cycling and always wanted to buy ne. I recently bought a cycle and the experience was god. However I always thought that the shop keeper had cheated me as the gear shift on the front chainrings were difficult then the rear cogs. Thanks to this article I noe understand the basics of cycling. This article is very informative for beginners like me. Thank you.. Appreciate it!! Good article. I have a 9 speed bike with a compact on the front (50/34) which gives me 18 gears. What I don't understand is if it's a no no to use certain gear combinations, then what's the point of having all that gearing at your disposal if you don't need it. Many a time I have gone up a hill on the big chain ring with the chain on the large freewheel sprocket! I have done this because it is there and it makes it easier. Great article! Crisp and clear. It is good to learn so much about the gears that we ride with. Thanks for the 'pregnant pause' insight, at first I had felt something wasn't correct with my bike however trying what I read made the difference. duh.... i had no idea. now, i enjoy going down hills and up hills everywhere. excellent article. easy to understand words of advice and pictures. Interesting and useful article - I've used gears for years but had forgotten after a period away from bikes when to use the front rings most appropriately. And you've spelt stationary correctly! The reason I stumbled upon this article, is because I've just dropped my (new-ish) bike off at the cycle shop to repair a front dérailleur which had pretty much self-destructed. Like many comments on here, I cycled everywhere as a kid- then got a bike in my 30s after not riding one for 15-20 years and rode around, moaning about how bikes are just over engineered now. Whilst reading that article, I think I did/do everything you said not to do! Every "one of the most common mistakes is..." And in my minds eye, there I am, standing up on the pedals, crunching up and down the front gears. I'm printing this page and going on a long ride around a car park as punishment for what I did to my (not-so-long) suffering bike. Sorry bike, it wasn't your fault at all.. Excellent advice! Just got a bike for the first time in 20 years and I was making some weird sounds and after reading this, I think I was putting it in the rattling state of limbo you mentioned. At first I worried there was a mechanical issue, but as I was sometimes successful with no rattles, I realized I probably needed to learn how to use it properly. I'm really grateful for the info! Im a new bike rider, now i need to know what gear i should use before a hill and starting off. Thank you so much for this article! I haven't ridden a bike in over 15 years and just bought one off of craigslist to start getting more exercise and boy was I confused by all the gears this thing had. I guess my barbie bike didn't have all those fancy things. So this has helped me a bunch! I will save this page and continue to come back to it! Thanks again! Fantastic article. Such clear explanation and advice - I am passing this on to my other 3/4 so she can gain the benefit that I have from this. Many Thanks. I bought my bike eighteen months ago. I have never used Derailleur gears before, only bikes with an internal rear hub, and as the chap in the bike shop simply wheeled the thing out of the shop for me, without so much as a word, I never gave using derailleur gears a second thought. I have been struggling since, until I read your article that is. Thank you so much for telling me what I should have been told in the bike shop, and telling it so well. Now I know where I was going wrong, trying to change gear on hills and so on. Thank you again! Nicely written and interesting - you spelt stationary wrongly! Very useful article for me. Thank you. good info,ive just brought my self a 21 gear fast road bike,my concern is left and right getting this right,gear change.m. Thanks to my grandchildren I am back on a bike for the first time in nearly fifty years - a scary but exciting prospect! So far I have locked completely on a slope and another time my chain came off.....I shall no longer blame the bike (it wasn't expensive)and I shall go and practise in some discreet corner - thank you SO much for this article. Just started riding bike again for first time in 44 years and it's totally different thing now with the modern gears, hadn't a clue, scary! Thanks for sane, not too technical explanations, really useful aid to understanding and practice; now I know why chain came off first time out! Will be practising, practising practising along our luckily quiet country lanes. Also recommend The Cycling Bug short videos on cornering, putting chain back on and post-ride maintenance. Cheers! I haven't ridden a bike since I finished being a student in 1990. Now I have a new bike again but I was so confused about the gears. I get it now. Beautifully explained. Thank you. This is just what the doctor has ordered...helpful reading. Thanx a lot...been riding for a while now with little understanding of the operations of the derailleurs,noe ive got it. Thank you, what a very well written article and most helpful to one who has been off her bike for a little while and needed a refresher course on gear use. My bike will be pleased i read this! Thanks for this! I just got my bike back on the road and starting riding it again after 20 something years, I needed a bit of a refresher on the chainset! Thanks so much for the clear explanation. I decided to venture out and engage the LHS on a recent trip on my new bicycle. My gears locked up completely going up a hill and I was just barely able to clip out. I will shift earlier now. I really like the explanations and pictures of the gear angles. Only just got the bike, so only one short run so far, but this article has been brilliant in reminding me of everything I'd forgotten in the 15 years since I last got on a bike. Thanks! A perfect article - many thanks for all the information and help. I have just bought a new road bike and was concerned about riding it and using the gears correctly. Your clear explanation and good advice will be of great help to me,thank you. Good Article - Just what I was looking for!! A fine work, fine articler! Things I had to find out with some pain (sometimes phisical :) ) are now clear and now there is the possibility to learn the rest easily. Thanks! 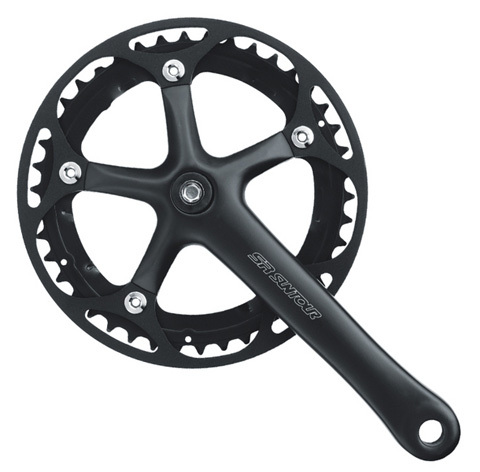 If I may ask a question: Does anibody knows where to get a rear hub with two freewheels, both right for usual cassette AND left for a single cog driven with a motor? Could Admin let me know in case of an answer?Thanks in advance! This is about the 15th article I've read and by far the most useful. thank you for keeping it simple. I really enjoyed the writing style. Very informative but felt as if it was non-technical - and with a sense of humour! Thank you. Thank you! Thought I had better learn to ride a bike, not to be outdone by my 7 year old daughter. Got a very cheap bike to learn the basics but quickly went to an excellent bike shop to get a better one. I take delivery of it this Saturday, and my poor partner has been trying to explain the gearing has now given up and passed me the iPad with this article. I shall be heading to the playing field on Saturday to practise, practise, practise gear changing! Just bought a new bike to help with my fitness as I am over 60 the gears were my biggest concern. Your easy to read article gives me a lot more confidence. Thank you. Good thing I came across with this article. it'd really help me understand transmission components. Now I'm gonna enjoy more on riding my bike. Thanks! I recently got a new bike with derailleur gears. Never had one with those gears before. I tried to change gears but failed miserably! I had no idea what I was doing. Thank God I found this website... Thank you so much! Superb. You should write a book 'The Complete Cyclist', or something. You could go into detail about all aspects of the machine, plus peripheral things like how to be seen at night, safe cycling, etc. Cycle route maps could form a part of your book. With the popularity of cycling growing, you could be set up for life. I would certainly buy it. Many thanks! Really brilliant! Thought I had just one question about changing through the front set and realised when I started reading that there was loads I didn't know. Thanks! going to have a browse around here now and see what other bits of bikery you have shared. 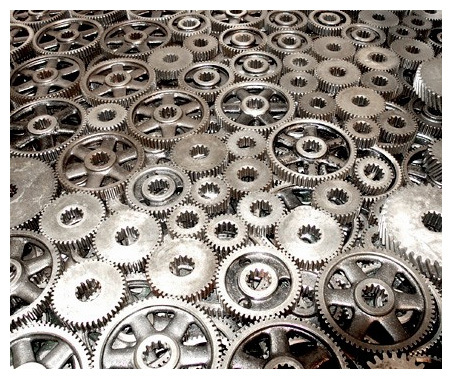 A brilliant piece of explaining the mystery of these gears. Thanks a lot. I too have been having trouble with the LHS trying to shift from 1 to 2. Now I shall practise what I have read, shift , & a pregnant pause. A really interesting and enlightening read; thanks! 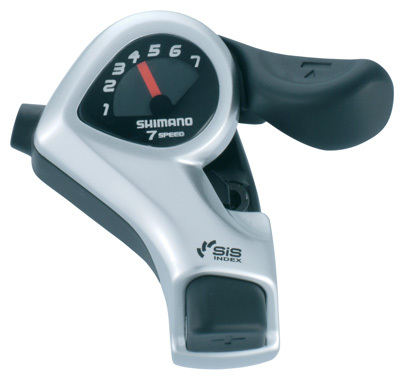 Started riding to improve my fitness a year ago but have had my left shifter on the lowest setting all this time because I didn't know how to use it. I thought it would be safer to just use 1 to 7 on the right hand shifter! I will try to be kinder to my bike in future. New to mountain biking but just bought a brand new bike. Had a minor spill a couple of days ago and the chain came off. After a quick fix, i started Shifting the front chainring to make sure no damage had been done. I was not shifting properly and thought that i had messed up my bike. Took it to a shop and they said that everything was working fine but i wasnt convinced. After reading this article, i have a much better grasp and now know that it was a user error and not an issue with the derailleur system. Thanks!! Really clear advice, I just had my new bike delivered and was having a bit of trouble with my front Derailleur shift, but after your explanation, I can understand where I am going wrong. Fantastic article, I would say most people do not understand gears and wouldn't admit to this, it was just the clear and jargon free information I was looking for. Many thanks. Thank you for your clear and concise advice. Many thanks this article cleared up a debate between my husband and I! I said we needed to use gears more regularly, he was of the opinion we staid in the same gear-ha! Great article. Thanks for writing this article. It really cleared up some terminology, and even better correlated gear size with high and low gear relationship. Once one gets use to it, using the derailed is quite intuitive. Brilliant! This is technical writing at its best: useful, logical, light-hearted. I learned everything I wanted to know and more. Now I have the perfect reference to go back to again and again as I practice. The captioned illustrations are immensely illuminating. Thank you!! Great article - concepts are very well explained. Thank you very much! 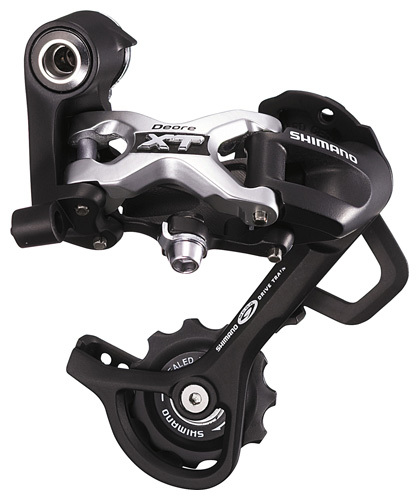 A really useful trick to learn on multiple front derailleurs is where the rear sets overlap : on very changeable terrain shifting the front derailleur in the mid range can be smoother than changing when in bottom or top of the rear set. Great article. I have recently switched my ride from a mountain bike to a touring bike and have not been finding it an easy transition. I live in Exeter, Devon which means changing gears OFTEN on any (inevitably hilly) ride. Your easy to understand advice should help me avoid crunching too much. Thanks. Thank you for your very clear and concise instructions these have been extremely helpful to a 63 year old beginner. Fantastic! I have just bought a bicycle from America, (delivered today), and I have yet to assemble it, but I am really looking forward to using it and your comprehensive and easy to understand article, has made that prospect even more exciting. Thank you. Very helpful, clear and simple. Thank you. Great article - very well put together. My partner has had problems with operating derailleur gears, which she found really frustrating and I was struggling to explain them to her. You have picked up on some of the things we just find 'instinctive' after riding for a while. This will be really helpful in explaining to her and I like the idea of getting away from traffic and having a practice to build up confidence - it's best to get the technique sorted out first. Well done! Many thanks!! u open up my mind dudes.. I built my bike from discarded parts which I coolected.I have never had to purchase anything for my bike,as I have a garage full of parts,tyres tubes collected from skips,abandoned bikes.I find your article very helpful.Up to bnow I have adjusted gears by trial and error,persevering until adjusted satisfactorily.Thank you. Well...I have been riding bikes for most of my life. I purchased a Blade 4 Avanti bike a month vor two ago and have felt too intimated to ride it. However I got into the saddle yesterday afer a brief practice and still felt confused about developing a 'feel' for the gears. This article has provided me with greater onsight to develop a feel for the gears on my new bike. Thank you so much for all the detail. I just bought a Trek Lexa today and couldn't make it up our steep hill on my practice ride. This article is extremely helpful and gives me the motivation to get back on tomorrow and try again. Thank you!! Just bought a new 21-gear bike despite advanced years , no previous derailleur experience and recent hip operation. Such valuable information! Already it feels like a new lease of life! Well done. Clear talk about a complex gear mechanism. Very useful for a beginner like me. Great, easy-to-understand guide. It answered all my questions about how to correctly operate the derailleur gears. Thank you very much! Just loved the article. WOW! As one of those newbies who buys a bike and then promptly jams the front derailleur, this was a great help - especially the tip about avoiding certain combinations. Thanks for taking the time to set us straight. Back to the saddle! Excellent article, just what I needed to know. In particular the sections "Chain Line" + the images", and "Hints & Tips". Many thanks. many thanks, having just got a bike with all these gears your article has really helped me understand how to use them. I am 67 and my last bike was when i was 15 and only had 3 gears. your article has been a great help. Here in the Netherlands, most bikes use the easy to maintain internal rear hub. After I bought my first second hand derailleur bike for about 30$ today, I thought I could use a refresher. :-) Good article, thanks! Very helpful should make my cycling a lot easier. Very useful. Everyone must read this before riding a bike with derailleurs. Please change "With derailleur gears, you cannot change gear when you are stationery ....STATIONARY. Ditto to commments below. I've been putting off riding my new bike 'cos I was worried about the gears. It's also nice to know I'm not alone! Thank you for this article. Perfectly balanced tech stuff with information & advice. A +1 to all the thanks below - I've been trying to find some clear and easy information on derailleur gears all over the web, and this is exactly what I was looking for. Thanks for taking the time to express this so accessibly. Excellent article. I followed a like on Bike Radar to it and i'm glad i did. Explained a lot. Easy to understand advice and excellent graphics! I am picking up my new bike tomorrow and not having ridden for many years will really have to practice.............at least now I have an idea of what to do and how to do it. Thank you so much. Thank you for making me understand that I am normal in not understanding my new bike as I've been made to feel I should 'just get on with it!' I feel so much more confident now I know how the gears work. excellent article, easy to follow. my eleven year old son complained he was having trouble changing gears. no problem now, thank you, terry. Fantastic article, answered several questions i had been wondering about, thanks! Thank you so much for helping my brain to understand what my body--and my bike--have been doing. This explanation was spot on: just enough technical information to make sense of things, but not TOO much. I particularly appreciated the logical organization and clear, almost conversational writing style. Very user-friendly. Kudos from California! Great help for engineering course work on the evolution of the bike. Thank you so much. I have been Riding for many Years since Childhood and I dont get problems on my Bike. I might get the odd Crunch in the Gears if I dont Change in time. 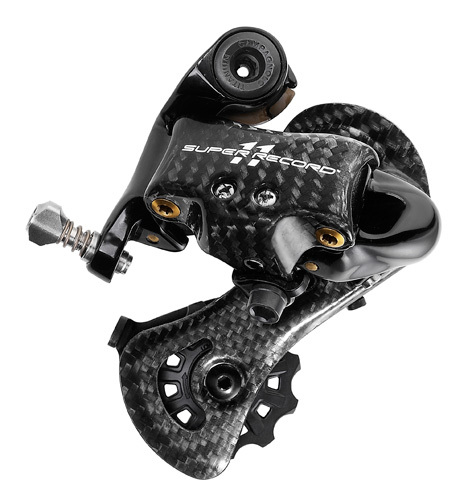 The Information that I wanted was about the Front Gear Changing Derailleur and when to use it for best Practice and about not putting Strain on the Bike and your Article has explained it very well ,very simply and easy to understand. Other Sites and Articles did not really give any Information about it properly .Thanks very much Dublin Ireland. Great read! I was so worried about shifting gears in my new bike I have barely gone anywhere with it. Haven't had a bike since I was a kid and so I didn't understand the second gear shifter. Now I understand what it all means and I am itching to get riding. Thanks for explaining it in basic, straight forward terms. Hit a lot of other websites which went into super technical details that maybe good for seasoned bike riders, but was gibberish for me. Thanks again for the help! Great help for engineering course work on the evolution of the bike. Thanks! Thank you. What a clear and succinct article! It is so refreshing to find experienced, good sense on the internet. I hardly ever use my gears but I shall now endeavour to do so. 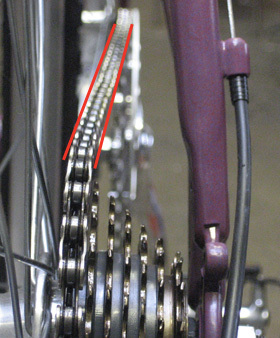 I shall also set my usual gear to a middle cog so creating a straight chain line. Great article. I understand more fully now how my gears work and the most effective way to use them. Thankyou. A lovely and in-depth primer for all! I've been forwarding your link on to others. Great job! Excellent article! Very clear and concise. Been having trouble with the chain coming off but can see it's probably more my fault than the bike's. Very impressed with your whole service. You're all very friendly and obviously know what you're doing, rare these days. At last it makes sense! I've been wincing on gear changes for over a year without knowing what to do - and feeling pretty stupid as the chain repeatedly came off. Thanks, your explanation is clear as a bell! A lovely article - explains everything perfectly. Can't wait to get out on my new bike. Thanks for taking the time to explain all of this, it has really helped me understand my bike after all these years ! Ah well, I wish I had read this before I went out on my little adventure yesterday. I had a 'crunch' moment and I almost cried because of the obvious pain my bike was in! Relating this article whilst reflecting on my adventure has given me a better understanding and new found confidence - so much so that I'm going out again today. Thank you. This was a great piece of information. I'm about to start cycling again after a 10 year lull. Really useful information well presented. Thanks! Great Article - very concisely and clearly presented. Do you have any feedback? Please let us know your thoughts.